If you follow me on Snapchat you probably notice that use the infamous wedding/bridal shower gift a lot. Last night I decided to make one of my family favorites. I am all for simplicity, I honestly tried this recipe on a whim and My family absolutely loves it. Yesterday, I paired this meal with mixed veggies and yellow rice. It was a huge hit (as always). Instructions In a bowl add the cleaned chicken and 1/4 cup of the marinade. Mix the two ingredients well (just as if you were adding seasoning. Cover the bowl and place it in the refrigerator for at least 30 minutes. Pour the chicken marinade in your crock-pot. (Include whatever marinade is left in the bowl on top of the chicken.) At this point, you could add 1 tablespoon of the marinade on top of the chicken or you could leave it as is.-optional) Set your crock-pot on low for eight hours. Typically, when my crock-pot as an hour left I will cook my sides at that point. This is also a meal that you can marinate and freeze in advance. Do you have a favorite crock-pot meal? 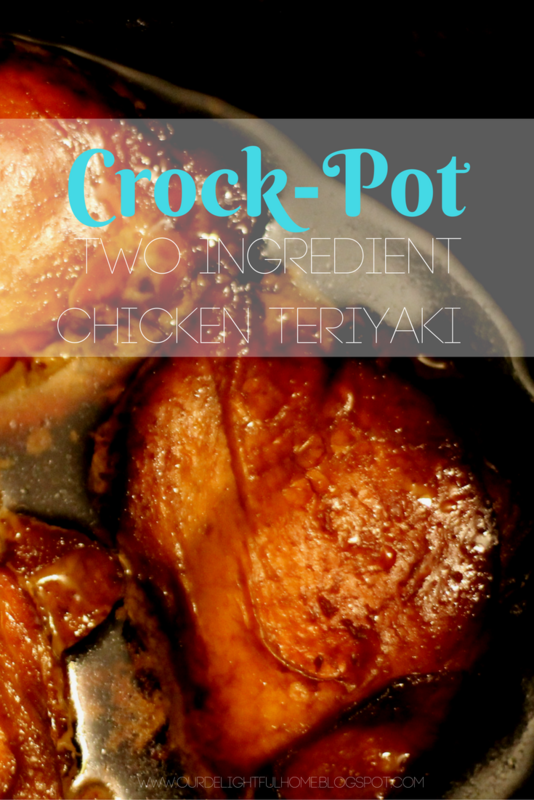 I love teriyaki chicken, but have never made it in the crockpot. Yours looks delicious. I love when I can make things in my crock pot. I will be trying this out. Easy makes me happy. I love teriyaki everything and I love crock pot meals...the simpler the better. Definitely want to give this a try. Omg this looks absolutely delicious! I've seen a lot of crock pot recipes recently which is making me want to buy one cause it looks like it would be handy! O wow this sounds so good. Because I can only basically eat chicken and fish, my family gets a little bored with the same thing, lol! I will have to try it this weekend for a different taste, even if it is still chicken, lol! Thanks for sharing. Looks delish! I love crock pot recipes... so simple!! I don't cook at all but my husband does and he loves using the crock pot. I'm gong to share this recipe with him. I love my crock pot, the meat always tastes so much better. I always wanted a crock pot!!! This meal looks delicious. I would love to purchase one and try this meal out.